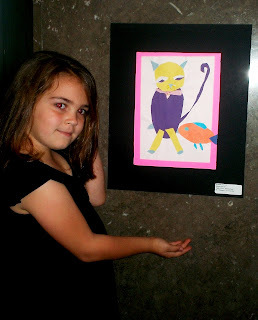 Here are all our pieces hanging in the Frist Center. I totally did not ask her to do model like this...she may have a future on Wheel of Fortune!! Morgan's(another kindergarten student) family was so excited her work was selected! 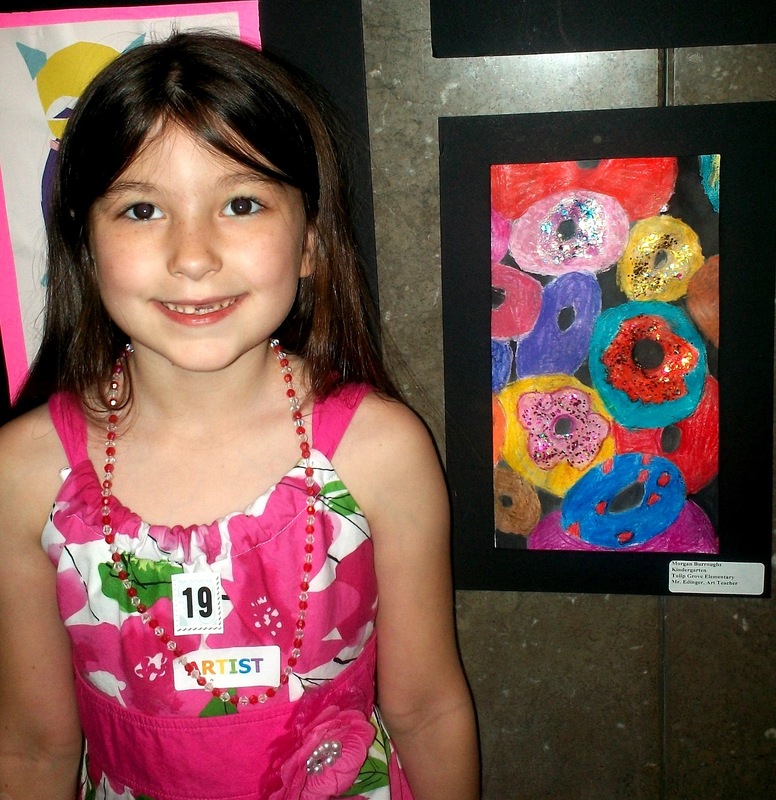 I love to see parents so supportive of the arts! 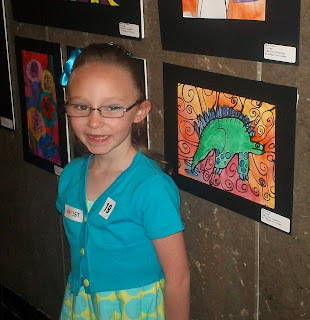 Alexia(1st grade) made an amazing warm & cool color dino picture! She is such a fun personality & wise beyond her years! I selected Benjamin's work much earlier in the year. 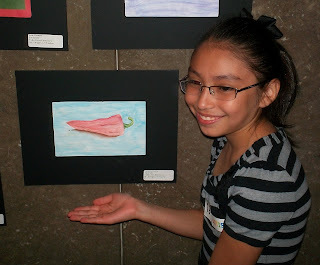 When I saw it...I knew it had to be in the Mayor's Art Show! Benjamin doesn't get excited about much, but I could tell he was very proud of his work!! 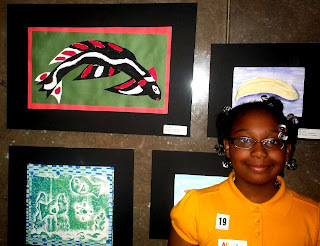 Sade(3rd grader) did this amazing fish! She has grown so much as an artist over the years! That is one of the joys of teaching at the same school for a long time...watching "your kids" grow up! I'm so proud of her!! Carolina's older sister also made it to the Mayor's Art Show when she was at Tulip Grove. 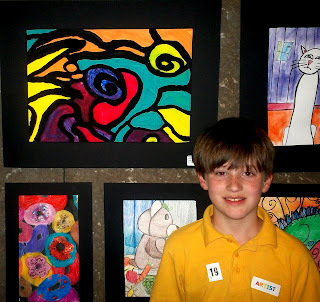 They must have an artistic gene that runs through the family! 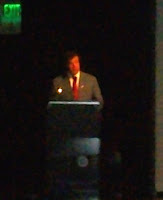 This is Mayor Dean...a very very bad picture of Mayor Dean! He has been great for our city..and has been a supporter of the arts! This was all the kids in attendance up on stage with the Mayor Dean in the middle! 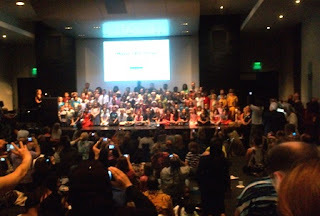 This show represents half of our district...MNPS is too large to have all at once. 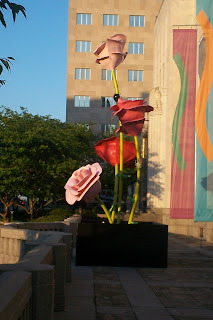 This amazing beauty was outside the Frist Center! I don't know how long it has been there or how long it is staying, but WOW!!! All student images were posted by permission of parents! DO NOT POST WITHOUT PARENTS PERMISSION!!!!! Beautiful Ted! We're so lucky to have you at TG!